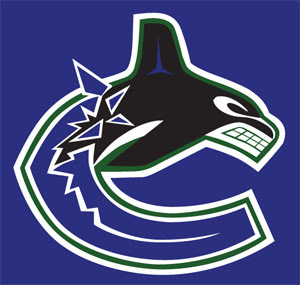 I came across this fan-made design on a Vancouver Canucks message board. The artist put a new spin on the flying skate logo and combined it with the traditional blue and green color scheme. What do you think? That's a skate all right. If you're curious to see what it would look like on a uniform, the designer took the liberty of putting it on the jersey template designed by John Slabyk to go with his logo redesign (which, frankly, I like a lot better). 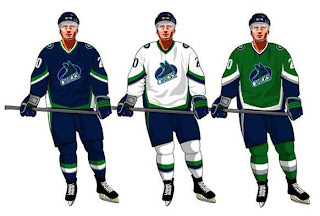 Incidentally, with all this about the colors being altered for the Canucks logo in the coming season, another fan toyed with the idea of bringing in the green to go along with the blue. He also trades out silver for black. Have a look.